I hope everyone is having a great New Year's Eve. In my twenties I loved going to friend's parties and ringing in the New Year. Now that I have two kids and am in my mid-thirties (we aren't talking about what age I am turning this year :) I prefer to stay at home and enjoy the beginning of the New Year with my family. 2012 had a lot of ups and downs for my family. My health for the first 6 months was all over the place with pneumonia, low potassium levels and a high heart rate. Luckily everything seems to be better now, but I am definitely ready for 2013 to be rung in. I will be surprised if my two kids make it much past 10 pm, but they might surprise me and stay up until midnight. I think I will make it to midnight and not much farther. When I was in college I could stay up all night and still be at work the next morning at 7 am, now I need my beauty sleep. My cooking this week has been easy. I haven't been motivated to spend a lot of time in the kitchen since my oldest is home for winter break until Thursday. This weekend I tried a new recipe for Thai Chicken Curry from the January issue of Bon Appetit magazine. This recipe has 10 ingredients. It takes a total of 45 minutes, 30 minutes of which is active and makes 4 servings. I did have to make a few modifications based on ingredient availability. First I have never seen yellow curry paste at any of my local grocery stores so I substituted green curry instead. Additionally, instead of regular Yukon gold potatoes I used baby Yukon potatoes. I prefer the baby Yukon potatoes when cooking since they are smaller and cook much quicker than their larger counterparts. I had no problems finding any of the other ingredients and made no further ingredient modifications. The recipe states to cook the curry on a simmer for a total of 20 minutes. I let my curry cook for closer to 30 minutes to ensure that it had thickened adequately. I followed the remainder of the recipe as written. I wasn't sure what my kids would think of this curry. They can be hit or miss with ethnic foods. Sometimes they love them and other times they won't even try a bite before they decide that they don't like the dish. However, I am happy to report that they loved this recipe. My oldest was especially fond of the chicken. The chicken turned out very tender and the potatoes were a nice addition. I chose not to serve the dish with fresh herbs since my kids were eating it, but it would be delicious either way. 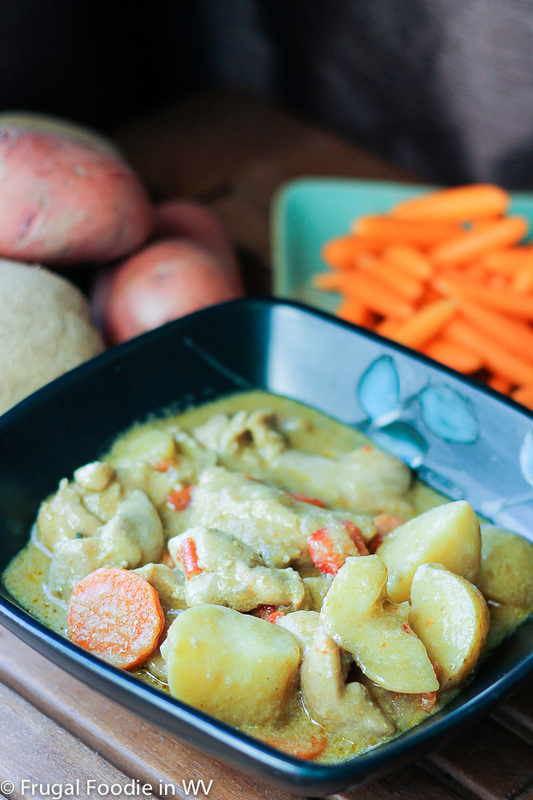 For the recipe go to Thai Chicken Curry.